For the past five years, Hayley Kincain and her father, Andy, have been on the road, never staying long in one place as he struggles to escape the demons that have tortured him since his return from Iraq. Now they are back in the town where he grew up so Hayley can attend school. Perhaps, for the first time, Hayley can have a normal life, put aside her own painful memories, even have a relationship with Finn, the hot guy who obviously likes her but is hiding secrets of his own.Will being back home help Andy’s PTSD, or will his terrible memories drag him to the edge of hell, and drugs push him over? 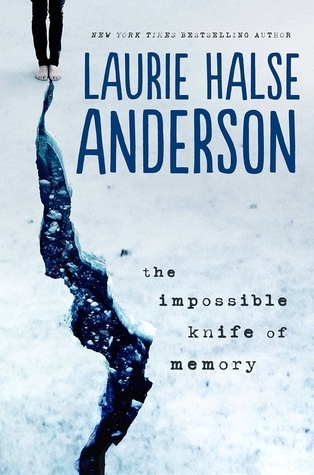 I fell in love with Laurie Halse Anderson's writing when I first read her book Wintergirl's. After that I continued in to read Anderson's books and all of them have this mesmerizing power to captivate you and make you think a little more. The Impossible Knife of Memory was able to do the same thing. The first point I will make is about Anderson's writing. She writes in such a beautiful almost lyrical way and I love it. Her writing is so smooth and almost haunting. It is one of those types of writing that just continues to pull you along. I finished this book about two weeks ago and I am still caught thinking about how beautiful it was. Laurie Halse Anderson does a fantastic job of taking very hard situations and making others relate to them. PTSD is a very hard but very real thing that goes on more often then you would think in the world today. Anderson is able to take a hard thing like this and write about it in a way that gets even young teens to really think about the issue at hand. Anderson is also able to write about it so it leaves an impact on the readers heart and mind without being too overwhelming. Another thing I really have to highlight is Finn. Finn is amazing and was by far my favorite character. He was cute, sweet, and incredibly funny. He is cast as the love interest for Haley and becomes the perfect support system for her. He and Haley had a ton of quick and witty banter that was a great aspect of their chemistry. I did have trouble with Haley at times though. She is one of those characters that at times you can really relate to her and like her and then a couple pages later she acts in a way that pushes you away from your feelings for her. When you combine the beautiful simplistic writing, the heart stopping topic, and the personalities that fill this book you have a real winner. The Impossible Knife of Memory is a heart wrenching read which I think teens and adults should all read.